One way or another, people will soon have all kinds of word vomit about Hercules and Leo - two chimps now implicitly granted the right to habeas corpus by the State of New York. 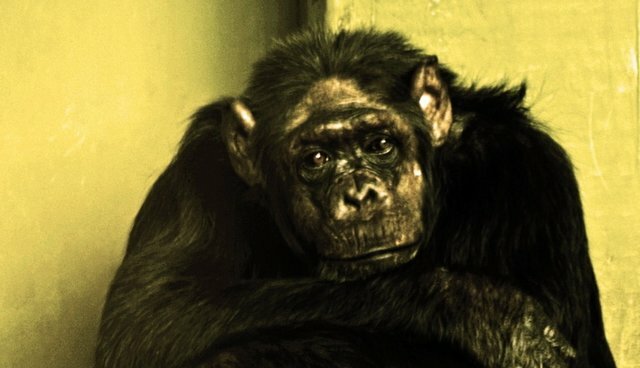 Justice Barbara Jaffe is now asking Stony Brook University to defend the chimps' captivity, in light of a writ of habeas corpus filed by lawyers from the Non-human Rights Project. Steven Wise - the lead lawyer for the NhRP in the case - claims that "only a 'legal person' may have an order to show cause and writ of habeas corpus issued in his or her behalf. The court has therefore implicitly determined that Hercules and Leo are 'persons'." Coverage of the case will inevitably accuse the chimp's champions of anthropomorphism - of ascribing human characteristics to something other than a human being. For example, we anthropomorphize a pumpkin, when we say that it has a face. Such accusations have plagued animal scientists for decades, dating at least as far back as the rise of behaviorism in the 20th century. Thanks to its scientific pedigree, anthropomorphism has been a silver bullet for opponents of animal rights and welfare movements. But even after fifty years in the chamber, it's not clear what "anthropomorphism" really means, or why it's so bad. Let this stand as a reference, then, for the volley to come. When people start screaming about how fool-hearted and sentimental all these damned activists are, remember this. What are human characteristics? If I say of my dog that he is hungry, is that anthropomorphism? Humans are sometimes hungry, after all. Of course it's not. It's not that every ascription of some human-possessed trait to some object is anthropomorphic. Human's are material, for example. We have physical bodies, located in three-dimensional space. Yet I'm not anthropomorphizing my screwdriver when I say that it's a material object. Only certain ascriptions are anthropomorphic. Only ascribing specific human-possessed traits is problematic - exclusively human characteristics. Most often, the relevant human traits are psychological. People complain when we describe the actions or thoughts of an animal in an objectionably human way. But again, not every psychological trait in humans is off-limits to animals. There's nothing wrong with saying my dog is hungry. If he hasn't eaten lately, he's hungry. Hunger is a feeling that humans experience internally. I'd say it's most naturally characterized as a desire to eat, and all sorts of other creatures experience it, too. Who can say whether dog-hungry is psychologically identical to human-hungry? Probably not. But surely it's no mistake to say that they experience hunger. If it were, how could we make any sense of the way dogs act when they haven't eaten? How do we intuit that their bodies require sustenance, if its not by accurately reading from their behaviors that they feel hungry? The most contentious ascriptions to animals are fully-fledged propositional thoughts and intentions. For example, when my dog walks in with his tail between his legs and his head down, we might say that he's done something, that he knows what he's done, and he feels guilty. We might even say that he has hidden the evidence, to avoid punishment, or that he is trying to apologize, or that he is ashamed of his lack of self-control. I mean, I'd bet the 4 million people who watched this video last year would. And the more complex their intentions get, the more likely that they're anthropomorphic. Obviously I can't settle here what is objectionable and what isn't, but at this point, its worth noting the gates are pretty wide. When we are allowed only our basic intuitions about the behavior of animals, in a way that best explains what we see, we can really ascribe animals a wide range of experiences. A couple meager assumptions buys us a lot in describing animals - complex emotions on the low end, impressive awareness and intention on the upper end. Before going any further, I can't overstate how important this is. In conversations about animals, and about Hercules and Leo, let's ask ourselves whether that's not already enough. That Hercules and Leo might fear their experiments, and feel physical pain may speak enough to condemn their captivity. And those meager feelings are allowed by anthropo-phobia, as evidenced by our dog intuitions. That these chimps might be lonely, confused, or sad in captivity says even more, and is no more objectionable. That they might want to be outside in a habitat they better recognize as home, that they could resent their situation, or wish for something different is, at worst, within the furthest reaches of anthropomorphism. Detractors pitch anthropomorphism as an unjustified, sentimental prejudice. Saying that dogs feel guilty, or that chimps long for sunshine, are just touchy-feely projections onto cold, incomprehensible animals. That's not how nature works! Only humans are like that! But are our commonsense ascriptions are the bad guy? When your dog comes in looking guilty, having done something you don't like, for which you've punished him in the past. Why shouldn't the default assumption be that he feels guilty? What grounds the counter-intuitive assumption that he feels nothing, and that we merely project guilt on him? Is there something about dogs that inclines us to see something in them that isn't there? It's true, humans are prone to anthropomorphize things - for example, we are more inclined to interpret senseless robots as having interests once we give them names. But why should we import that finding onto our feelings about animals? Why is it a better, safer, more rational position to first assume that animals do not have rich inner lives, and try to explain their behaviors away? What evidence supports that assumption, rather than than the natural, widespread, intuitive assumption? The animal minds assumption has a clear champion: animals themselves. The behavior of animals proclaims that there's something deep going on in there. No matter how different from humans it ultimately is, it does not seem different enough to warrant dogmatic denial. The vehemence of that negative verdict, the vitriol of the prohibition on animal feelings, betrays the real prejudice. After all, our ascriptions are not really unfounded. Our feeling that a dog is hungry is justified by everyday interactions with dogs. The view that they feel hunger explains a lot. It explains their actions, their sounds, their appearances, and it empowers us to make accurate predictions on a wide-scale (for example, I accurately predict that my dog will stop whining once I put food in the bowl, and so he does). More than that, though, that animals have feelings, thoughts, and desires of some kind is so deep in us. What is less obvious than that animals are mere automatons, to whom food and water are like a battery charge, to whom stimulation is just routine maintenance? Those who accuse us of anthropomorphism thus contradict all evidence and appearances. What is that, if not an unjustified prejudice? The view can only be justified by a vicious circle: chimps don't have deep desires, because those traits are exclusively human, and chimps aren't human. But how can chimps prove their longing, if every sign of longing is dismissed as chimpish robotics? And why should we dismiss the signs, unless we've already decided the conclusion? At worst we should be skeptical - we should not be sure what's going on in a chimp mind, be it rich or empty. But the view that chimps might be lonely is met with hostility, not skepticism. Their assailants are certain that chimps do not exhibit these emotions, a view that could never be verified, even in principle. A view that cannot be verified is, by some counts, exactly the mark of pseudoscience. The unjustified view is that animals do not have rich inner lives. On that view, it is impossible to explain animal behavior, even in the most mundane circumstances. It is contradicted by every single human and non-human interaction that anyone has ever had. It entails an irresolvable other-mind skepticism that condemns all human interaction as we know it. It reeks of circular reasoning - who wants to think their experiments have been on conscious, feelings creatures? The entire body of human experience weighs as evidence that at least some animals share with us a deep, mysterious psyhological complexity. Or, at least, it says that our lots are cast with theirs. Either they are conscious and intentioned with us, or else we are no more than they. None of this is to say we should start looking for ways to explain all animal behavior in the most familiar human way possible. The animal kingdom is incredibly diverse. For many of these creatures, whatever inner lives they lead are likely beyond the scope of human imagination. The Walter Mitty of, say, jellyfish, would not likely be a popular character. It just means that, in the case of two lonely, tormented chimps, there is nothing objectionable in admitting they have had enough. It only means that when we face animals in our society honestly, we are allowed to call things what they are. If anyone is projecting, it's the animals. The fear, the hopelessness, the depression, and all the enormous physical and emotional suffering are being projected to anyone that will listen. It's not anthropomorphic to name a creature begging for help, when it is.